After years of docks that were too short, too slippery and sometimes underwater, Thornberg Construction completed phase 1 of the Lake Sammamish State Park boat launch improvements that added two much needed floating docks for the Washington State Parks. Architectural and construction services were provided to turn this family room into a dream room. Before photos show the different colors, styles and textures in the room. From the kitchen you walk through a new pair of glass pocket doors to the family room. 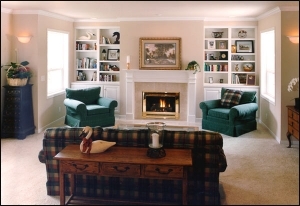 The windows on either side of the fireplace were removed for privacy and detailed bookcases put in their place. An updated fireplace with a marble surround and custom mantle accentuate the entire room. A drywall ceiling, the creative use of lighting, the windows and the painted millwork give the room a bright and cheerful look. The crown molding at the ceiling adds a special touch of elegance. The furnishings and carpet complete the feel of a warm and comfortable room. 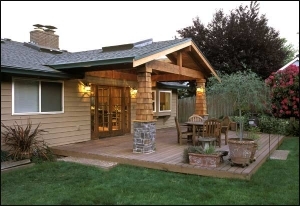 This covered porch adds elegance to the back of this home and is functional for the Pacific Northwest weather. The open beams, shingled and rock columns and lighting make an inviting space for outdoor relaxing or entertaining. The large skylights on either side of the roof let in lots of natural light. This room makes for a great escape to enjoy your favorite videos, games or music. 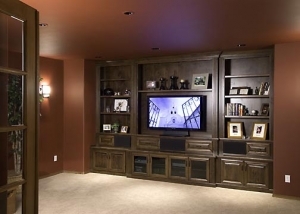 Dark colors, variable lighting and surround sound enhance the media experience while noise deadening acoustics help contain the sound to this room. The entertainment cabinets along with another set of cabinets in the room help organize the electronic components and keep the media accessible. Thanks for doing a nice job on our addition. We are happy with the quality, and appreciate that it came out on time and within budget. Copyright © Thornberg Construction Company, Inc.